Make a World! Tulip Flower World! 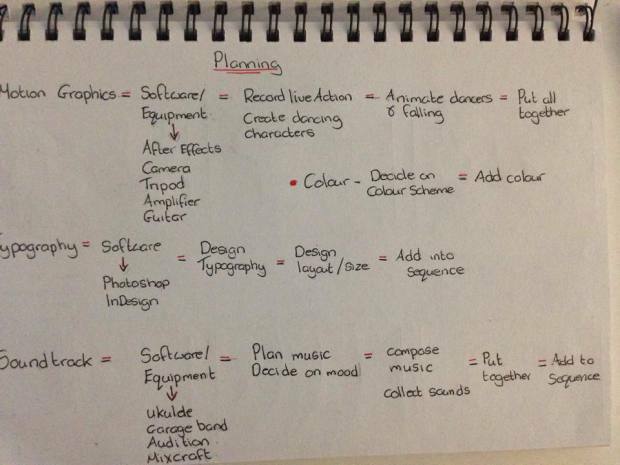 For our final project we have a 2 week period to design and create a game that is playable within our world. We got sent to a new team and a new world. This week I was teamed with Thomas, Kristina and Rosie and we were put on the crystal egg world. 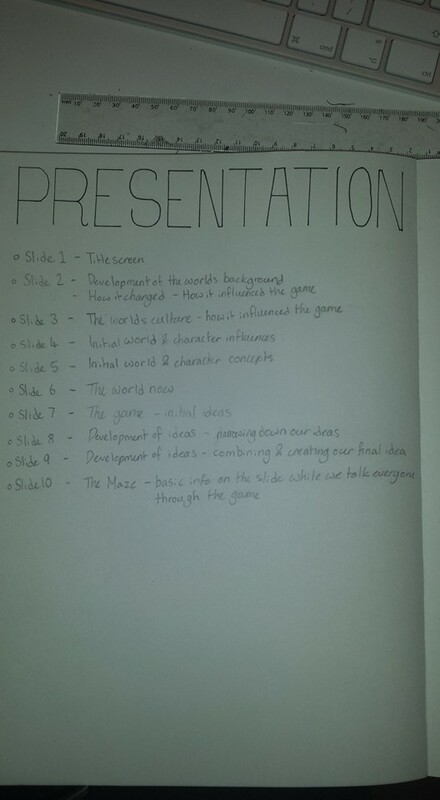 We started off looking at some of the older groups work and what they did with the world and then began thinking about what we could do for our game, we came up with a lot of ideas, me and Thomas had a huge brainstorming session and wrote down a bunch of ideas. We looked at how in the world there would be different stadiums through out the world and how they would change based on where they were geographically. Thomas began researching some concepts for mazes. 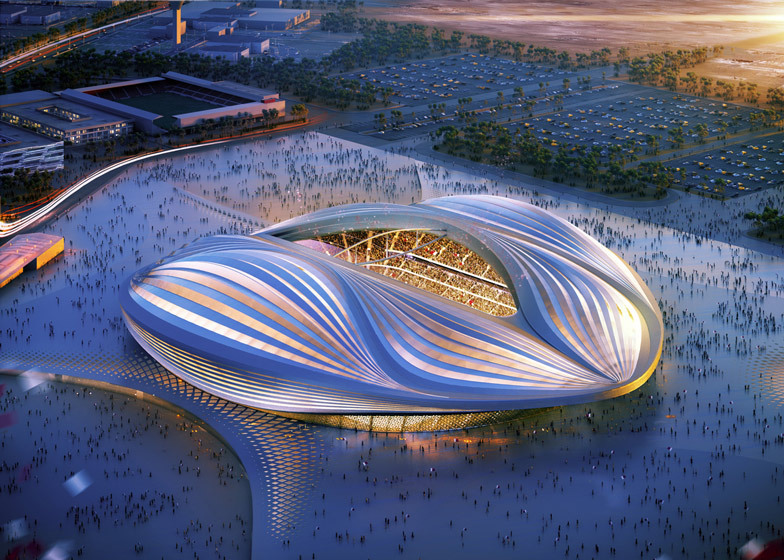 Thomas then started to draw up some concepts for what the stadium could actually look like in the world. We brainstormed for a long time writing down whatever came into out head no matter what it was since it could have been an idea that would spark brilliance. 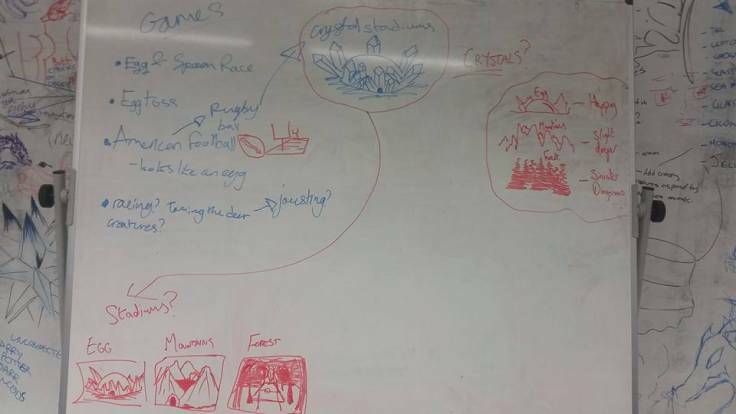 In the end the random ideas did actually help towards our final product as some ideas that we had originally ended up being in the final game, like the easter egg hunt style game. 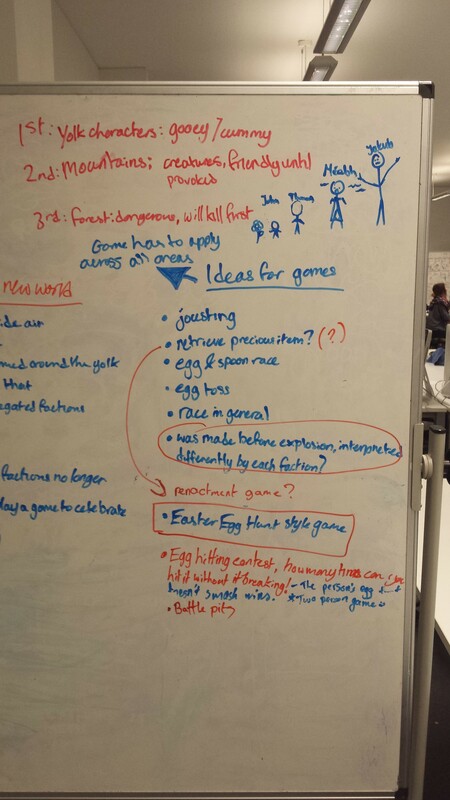 However after all the brainstorming we were still fairly lost about what we should do with out game. So instead looked at what kind of game it would be played as. we first of thought that the best route to go down would be a board game like snakes and ladders that children of the world would play. Since the backstory of our world was that after a magical object worshipped by all the creatures was stolen a war broke out between the territories, the resulting expolsions from the war caused the crystall shell of the egg to crack and break apart revealing the inside. We thought that the game could be played by the children of the territories and this game would help bring the communities back together through their children. The game would be played as a board game, with a grid layout like snakes and ladders. 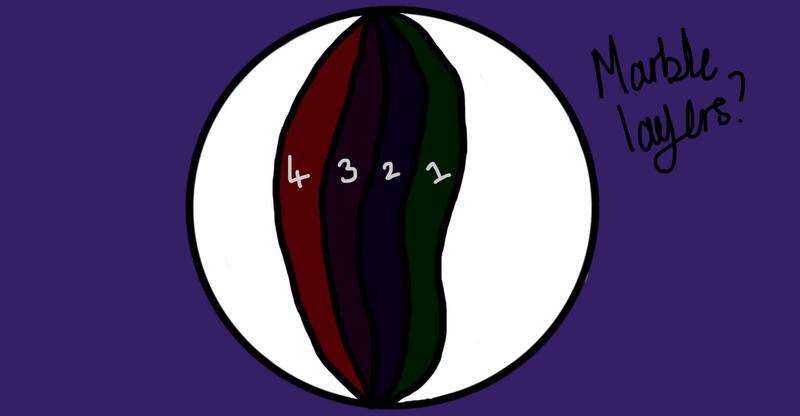 The objective would be to reach the end first and you would claim the prize (this prize would have been the magical item worshipped by all that was stolen in the war). There would be short cuts in the game like climbing trees if you were playing as a forest character however this was far too similar to snakes and ladders in fact it was basically a re-skinned version of it. so we decided to scrap this idea. Another old idea that we had was an easter egg hunt. We thought that we could build the game around the idea of bringing the territories together. It would be team based, there would be 3 players per team, 1 from each area however we decided against the idea as it wasnt original enough. Rosie had an idea that she put together, it was based around the characters moving up a social ladder, they would have to complete puzzles/ riddles to move up the ladder and the ultimate goal was to reach the top of the ladder to win. 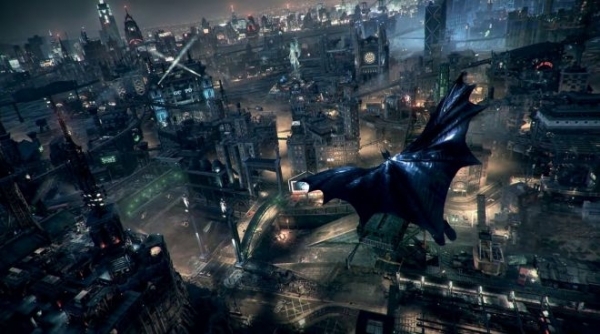 However it took away from the culture aspect of the world and focused more on the economical aspect of the world but the ideas that Rosie put forward for how the characters would advance in the game, stuck with us and they ended up being a major part in the final game. With none of these ideas sticking and we were starting to get worried we decided to go back to the drawing board and get a final idea. We looked at the snakes and ladders game, Dungeons and Dragons, cluedo, pac man and finally the maze. 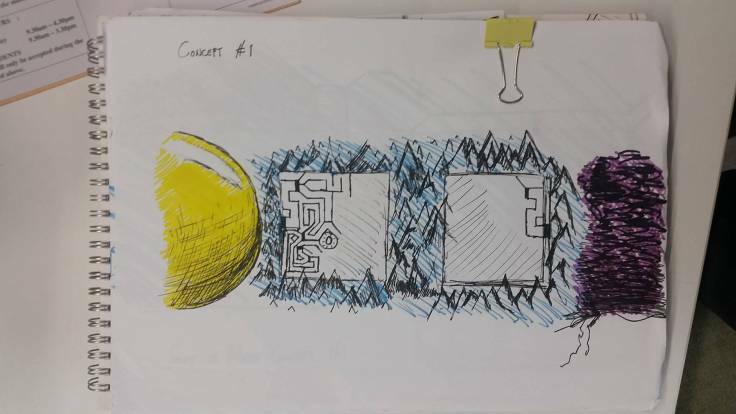 The maze idea was one of the only ideas that really stuck out so we looked into it more. We thought what way it could be done, a board game? a physical maze? we weren’t sure but we were just glad we have finally had an idea that was sticking. After this we thought is it really the best idea to have everyone getting along after the war? so we decided that we would have the territories still hate each other. The maze turned out to be a really great idea so we stuck with it. We initially wanted to keep it as a board game where the movement would be based on dice roles (You would move a certain number of tiles based on the number you role, this idea was taken from D&D and cluedo as they both revolve around a free roam of the world the game is based in). 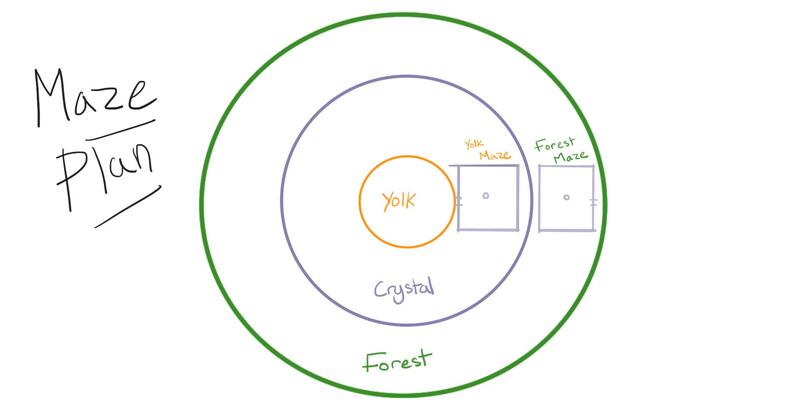 There would be 2 board games, forest and yolk, the two sides games are the similar with the same objective and layout however the enemies that you encounter in the game (to set you back tiles etc) are based of the opposing territory (eg. the yolk game will have forest creatures as their enemies). We decided to not include the crystal mountain area and instead have the mountains as a separating wall between the two territories and the creatures living their to be neutral. After working on the maze for a while, designing new mazes and researching how the maze would look in the world, we saw a big flaw in the game. The players could see the routes. It was a board game so what would stop the players from just looking ahead see the path to the middle and just following it, it takes the mystery from the game, makes it far less competitive and makes the whole idea of a maze game too simple. One idea that we had was that there would be a cover over the top of the game and as the players moved through the maze the top would be gradually removed to reveal the route they’re going however the major issue with this was that it was too hard to try and create a cover that could be taken apart without again giving away the route of the maze. Another problem with this would be it just wouldn’t be fun to play or look at. Here are some concepts created by me and Thomas. Thomas used a maze generator to get the design for his maze. After this we decided to instead bring the maze into the world itself and have it be a physical structure within the world itself. The origin of this maze is unknown however it is now seen as a rite of passage for the children of the territories. They must complete the maze to enter into adulthood. This maze is a tool of fear. It promotes hate of the opposing territories and continues the divide started by the war many centuries ago. This was when our idea finally began to fit together. – Game has developed from a maze based board game to an actual physical maze within the world itself (a rough layout of the mazes location within the world is included below). – We changed the maze from a board game to an actual physical maze because it was hard to design a maze on a board game without taking away from the mystery of the maze like what was around each corner and where to go. – The maze was designed so to spread the hate of the opposing side and to keep them from merging and to carry on the grudge of the war that happened. 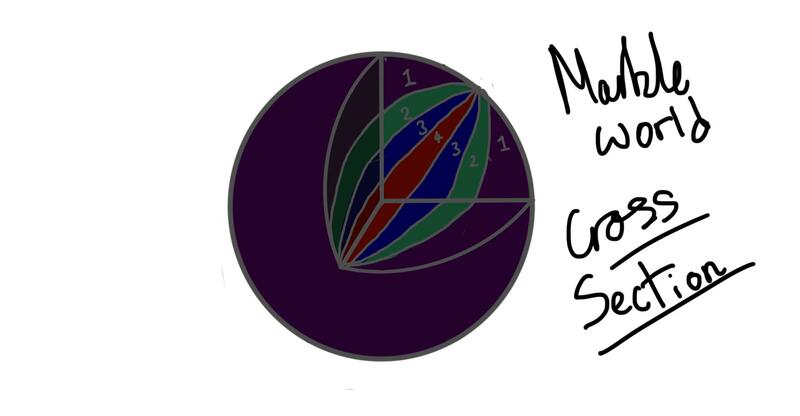 Here is a concept designed by Thomas (below) based of my own (above). After this we knew what to do and where to go, we were ready to develop the game. Finally we were on track and ready to roll. Thomas began to put together the animatic for the world that shows how the riddles in the maze work which turned out fantastic and really was vital in showing how the maze looked and how it worked. Possible another consequence for breaking the rules? -The Characters start to loss their vision, eventually going blind as they hear the voice of Bloody Mary in their ear singing the Three Blind mice. They feel a knife go across their face, when she wishes them goodluck and leaves the to wonder the maze blind. Rosie also brought up one of my previous thoughts about influences for the game, The Third Task in Harry Potter and the Goblet of Fire. 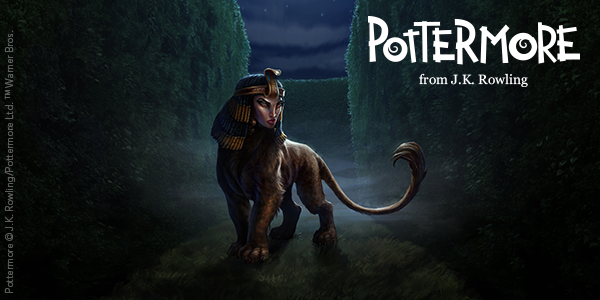 Personally I found the book version of the maze task to be more influential than the movie version as at one point in the maze Harry meets a Sphinx who won’t let him past unless he answers her riddle correctly. Thomas created some poster’s for our main character Gleep, he based it on World War 1 and 2 propaganda. It fits that they would have propaganda as the grandparents and parents have taught their kids that the maze is a part of life. Thomas also did some alternative concepts for Gleep using a variety of colour palettes. 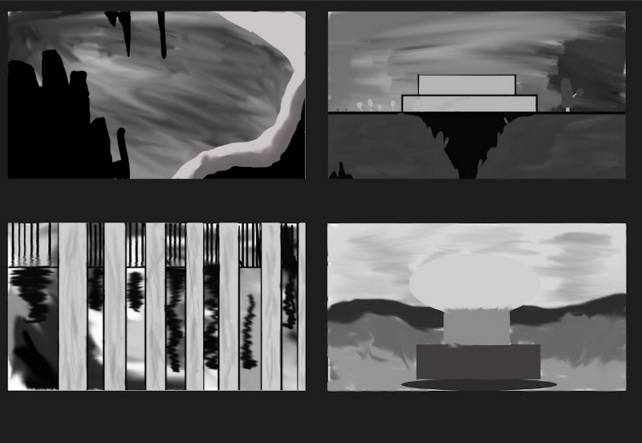 I also worked on some concepts for out world to bring it to life more. I wanted to show what the maze would actually look like in a 3D environment so i had a go at creating it. The 3 open squares are where there could be an exit so there are 3 possible exits but only 1 is real. I also decided to give the maze and smaller mini maze on a raised area just to give it more dimension. I also made an attempt at 3D modelling one of the characters that recurred through out the weeks and that appears as the main character in our animatic, this character is called Gleep. One thing that I found that I was good at in a previous week was typography and a piece of work that I always found was awesome and had great typography in it was Tolkien’s maps from Lord of the Rings. So i decided to do a 2 page spread of a Tolkien style map of our own world. Later on after I completed this I wanted to do another because I was so happy with how the first had turned out but I didn’t know that many famous map designs but I was recommended to look at World of Warcraft and Game of Thrones and I found this great map from World of Warcraft that shows two opposing figures with maps of their areas beside them so I tried to recreate that. The Lord of the Rings map (below) was created by J.R.R Tolkien I believe and unfortunately I could not find the creator of the World of Warcraft Map. The Tolkien map shows the positions of the mazes in relation to each territory. Since the creatures from the crystal mountains are neutral and guard the gates to the maze we all thought it best that the location of the mazes be next to the mountains. At this point we were coming to the end and we were finishing up with bits and pieces. Kristina gave us some more pieces of work that she spent a lot of time on and they turned out great. Basically since the characters are trained and taught about this maze for their whole life so when they enter the maze they will have specific attributes that they will have specialised in for the maze. Depending on where they are from they will specialise in different areas and they may not be able to specialise in areas where others can for example forest creatures can specialise in stealth and speed but not charisma or knowledge whereas the yolk characters can. 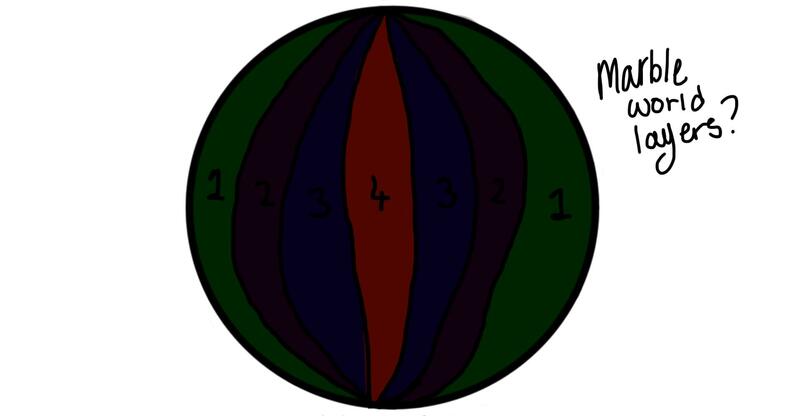 This is based on their backgrounds since the yolk people have always been more civilised since the very first week when the world was made whereas the forest creatures were dangerous and predatory so it makes sense that they can be stealthy and fast whereas the yolk characters are more charismatic and knowledgeable. These attributes would be represented by certain objects that the character would wear before entering the maze as seen in the pictures below, for example the wizard hat represents wisdom and the shoes represent speed. In the picture of the forest creature he is wearing a wizard hat and shoes showing which areas he has trained in for the maze. This means he will get advantages relating to wisdom and speed in the maze like he will be able to get away from monsters faster or he will be able to answer riddles quicker. She also did some beautiful drawings of the children being taught about the maze by their parents. Rule #1: Retrieve the precious item. Rule #2: Be prepared for all possibilities. For every corner, every shadow and every sound, could be the end for you. Rule #3: Play by the rules, or the rules will begin to play with you. 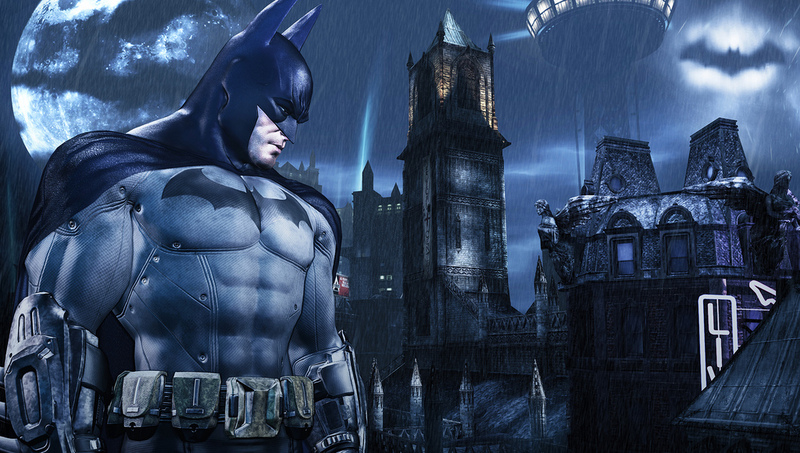 Rule #4: Gear up – Choose your characteristics wisely. If not, it could be your downfall. Rule #5: Think fast, act smart. Rule #6: Answer all riddles wholeheartedly. Rule #7: If you answer incorrectly and end up on an incorrect path, ensure you can retrace your steps effectively and get back on the right track. Rule #8: Show passion and determination to succeed. Rule #9: Know your enemy. Island – A section of the maze containing walls not connected to the external wall of the maze. Sometimes also referred to as a detached wall. Plainair Maze – A maze on something other than a flat surface. 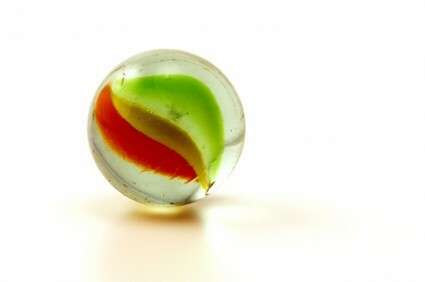 For example, a maze painted on the outside of a cube or sphere. Last but not least we planned our presentation, bringing together all of our notes and research together to touch up for presentation, we also made a rough plan to keep us right. This week we changed group and world, I was placed on the sound world with Michelle, Megan and Ryan. Our assignment this week was to create a trailer/opening sequence for our world. It didn’t have to be animated it could be in whatever format we wanted but we had to include typography and sound/music. So we kind of got lucky by being put on the sound world on sound week. Since typography is such a big part of this week we had to do a lot of research for it. We took some inspiration from Monsters Inc. One thing that was seen throughout the sound world was the association of shapes with different genres of music and in the title sequence for Monsters Inc. a variety of shapes are used. The shapes that we would use would be Squares, Triangles and Bubbles. Ryan then came up with the idea that the shapes come together into the shape of a character and then fall apart again. A character that appeared over an over was Equaliser. In the sound world animatic it shows Equaliser not fitting in and not liking any of the music so we thought we could fit her into our title sequence. In the end we decided that we would keep it simple and have Equaliser not enjoying the music. Michelle drew up some storyboards for the team so that we could plan it out better. The plan of the sequence is this. It starts with someone playing an instrument and creating a sound wave. The camera will then zoom in to the world. Using simple shapes the characters will appear before falling apart and showing the titles. Then finally settling on Equaliser. She will look angry and annoyed, she will then ‘pull the plug’ ending the music and the title sequence. The screen will go black as she pulls the plug and then the title will appear. 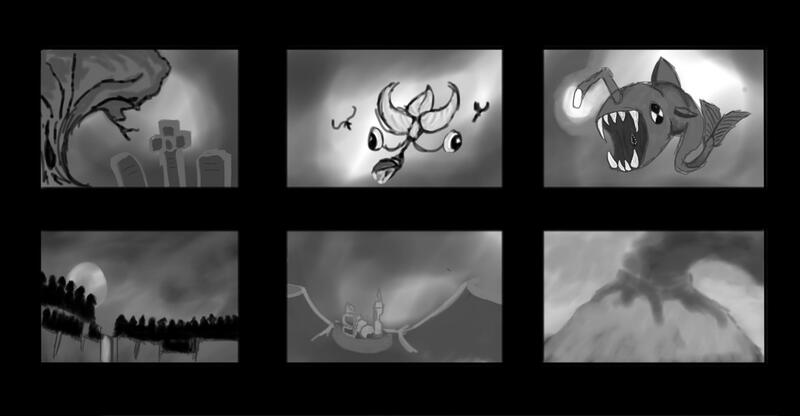 Here are the storyboards created by Michelle. I then looked at typography, we were thinking of using something relevant to sound. I looked at the famous rolling stones typography and implementing stuff related to music like an equaliser or sound waves. In the end we decided to go with the Moon Flower font. It’s simple and effective. With the music Megan brought in her ukulele. We decided to use four notes that are use in many different songs. We got the idea from this video which shows numerous songs that can be played with these 4 notes. Here is the final title sequence. Over these 2 weeks we stayed on the same world as before with the same groups so I was with Jack, Ryan and Even. Our challenge this week was to create a 90 second storyboard sequence and then from the storyboards create an animatic of our proposed animation. 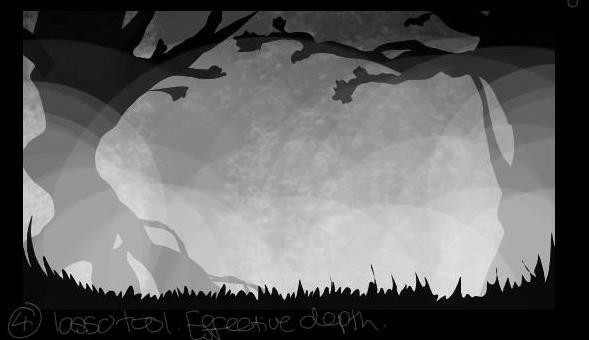 Animatics and storyboards can be rather challenging as you have to keep the style of the drawings consistent through out the motion and composition of the scene. 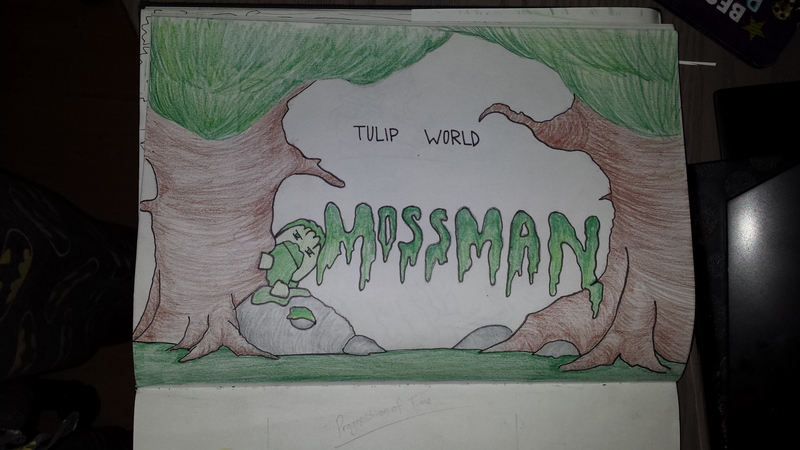 We decided to plan the storyboard around the origin of Mossman. The story goes, he was travelling the system in his ship, the apollen 18 when he sees a nearby planet, as he enters its atmosphere his ship begins to malfunction. 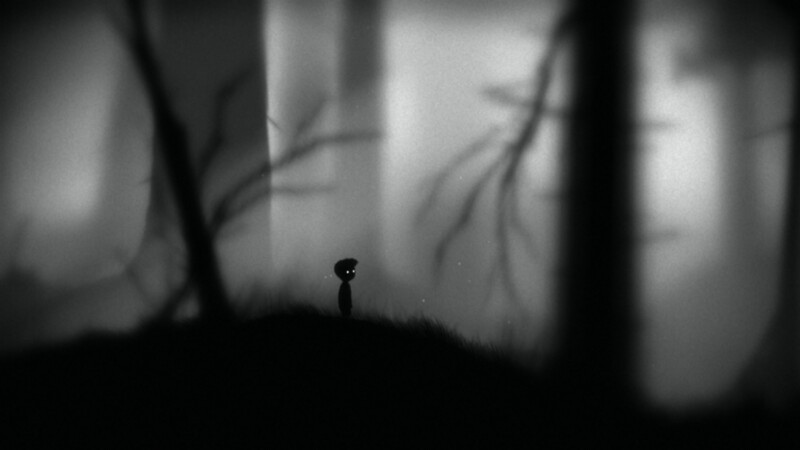 He crashes on the planet, after viewing his surroundings he heads into the nearby forest seeking shelter and help. At this point in the story we needed a way to show passage of time. So we decided that we would have the character pass behind an object like a tree, and when he comes out from the other side he would have changed dramatically. To help change the feeling of him losing hope we wanted to implement warm and cold colours, so where he came from would be warm colours and where he comes out and walks of screen would be cold colours. 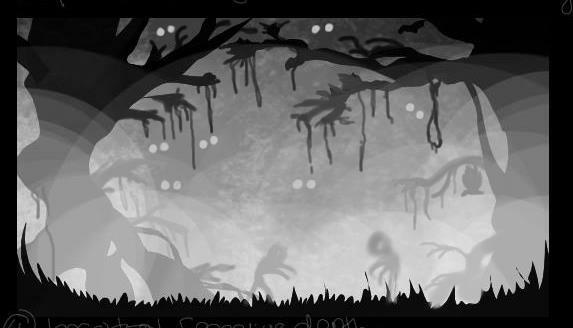 To end the animatic we wanted the character to wander aimlessly through the forest, weaving in and out of the trees on either side of the scene. 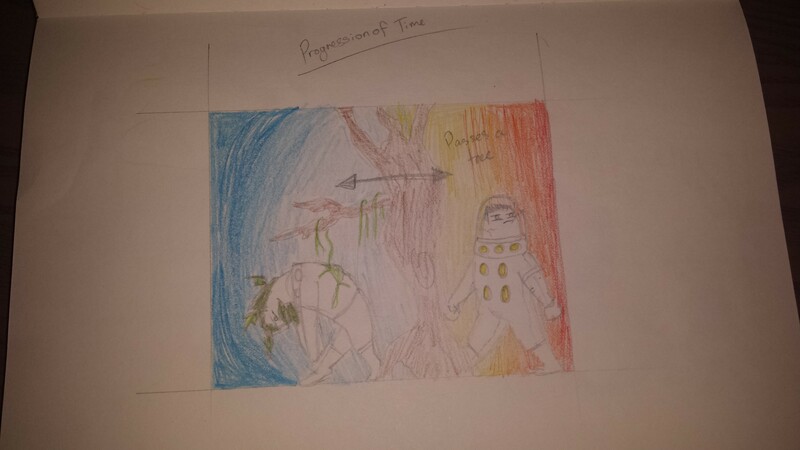 We also wanted to show that this is taking time, that he has been here for a long time and is becoming a part of the world, so with the last few scenes in the animatic we had the character get further away from the foreground, the scene would fade and he would appear further away until finally he would be really far in the distance and then it would cut to black. 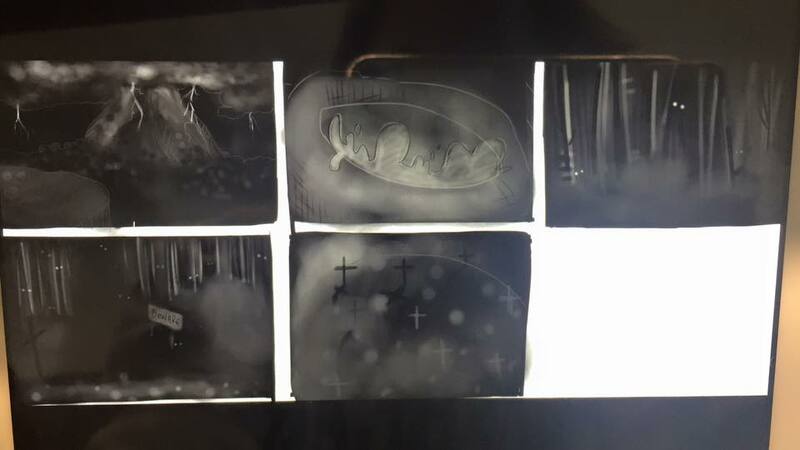 These storyboards are quite hard to see however they were the initial drawings for the storyboards and it helps show the development of our ideas. After we finalised the layout of what we wanted to do, Michael then talked to the class about how storyboards are drawn for an animation. After that I went back and did the storyboards again in the format that Michael had suggested. 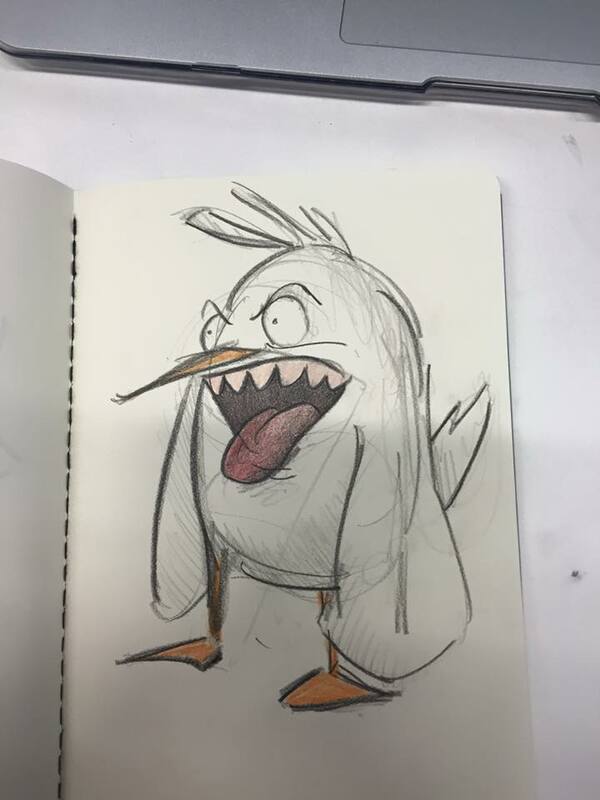 Ryan also did a rough animatic before the final animatic. This allowed us to see what it might look like and also what changes we could make to make the story clearer. 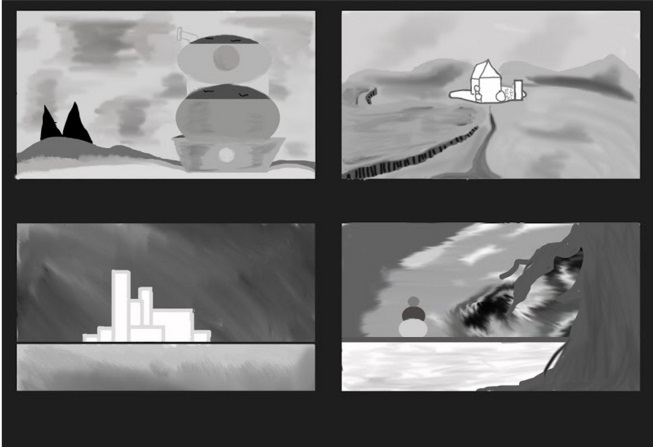 Jack also worked on a colour animatic to see what it could look like in colour. Here’s is just some extra work i did for this week showing the different environments of the world. The image with the giant deer like create was actually going to be a scene in which a giant foot lands in front of Mossman and when he looks up he sees this perspective shot. It was just to showcase the environment and one of the many creatures in the world. For this week world we got a new group and a new world, the tulip world/ the flower world! In my group this week and for the next few is Ryan, Eve and Jack. We were tasked with adding colour to our environments that we applied composition to last week, so we looked at the previous groups work with their different sketches and tonal studies and began to draw our own versions. 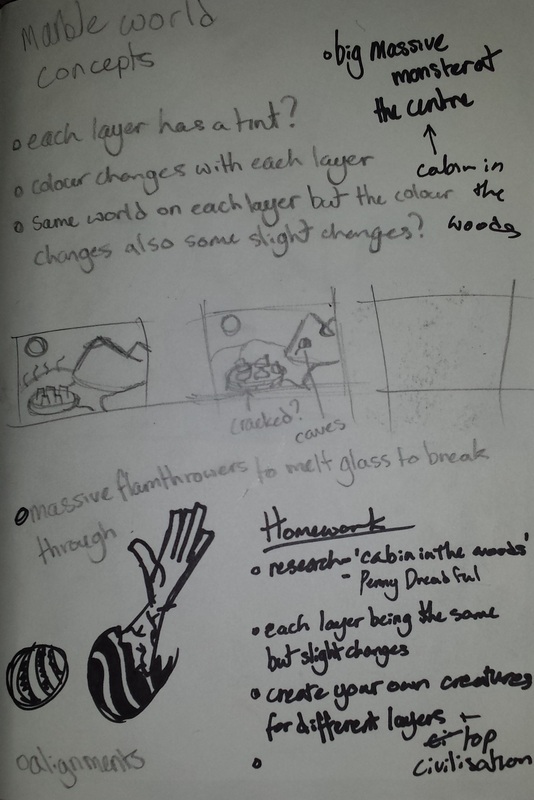 Our versions of the worlds environments were based on their designs but incorporating different things from each of their drawings, for example we used the perspective style drawings of the mushrooms in the world but incorporated Robert’s tree and face designs for our own work. Once we had a few sketches (not just digital, each person also had their own sketchbook work that i don’t have pictures off) we put them into our chat so that we could each start picking random pieces and painting. To do this we needed colour palettes so Eve linked us to the Adobe Colour Wheel which allowed us to create some Palettes and then put them into the chat so that we could mix and match and have a go at painting the environments keeping in mind warm to cold shades.